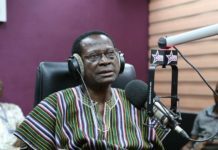 Kennedy Agyapong, has publicly alleged the outspoken General Secretary of the ruling NDC Johnson Asiedu Nketia has refused to pay back an amount of $200 he loaned to him some time ago to defray some utility debts. Maverick New Patriotic Party (NPP) lawmaker, Kennedy Agyapong, has publicly alleged the outspoken General Secretary of the ruling NDC Johnson Asiedu Nketia has refused to pay back an amount of $200 he loaned to him some time ago to defray some utility debts. The Member of Parliament for Assin Central made this claim when he appeared in Bawku at the weekend for the campaign launch of the NPP’s parliamentary candidate, Agbanwa Gabiana Abugri, a principal health professional. “God, why have you punished us like that? I mean, in this country we listen to Asiedu Nketia, a man who could not even pay his electricity bills. He owes me two hundred dollars. Up to now he hasn’t paid. I don’t know if he’s going to pay me tomorrow. The crowd laughed as he continued to ‘detonate missiles’ from a 5-foot-high platform, flanked on every side by regional executives and parliamentary candidates. The NPP’s parliamentary candidate at Bawku is in a ‘two-horse’ showdown with the incumbent contender, Mahama Ayariga, who is also the Minister of Environment, Science, Technology and Innovation (MESTI). NPP supporters rode motorcycles and motor tricycles adventurously through Bawku before and after the weekend’s campaign rally in what was a pure payback for a similar road show displayed by NDC members when Ayariga launched his own in Bawku only two weeks ago. The latest rally brought into play a coincidence that left observers in raw awe. The two main speakers seen at the NDC’s and the NPP’s rallies in Bawku- Hannah Tetteh (Foreign Affairs Minister) and Kennedy Agyapong- are lawmakers from the Central Region. And the Upper East regional chairmen of the two parties, who took part in the parties’ separate rallies, hail from the same Bawku Central Constituency. Hannah Tetteh prescribed a re-election formula for the NDC at the rally; Kennedy Agyapong, addressing a crowd about the same size of the multitude that stood in front of Hannah Tetteh at the Danduri Park, proposed four factories for every district and promised to lead the move himself under an NPP government. 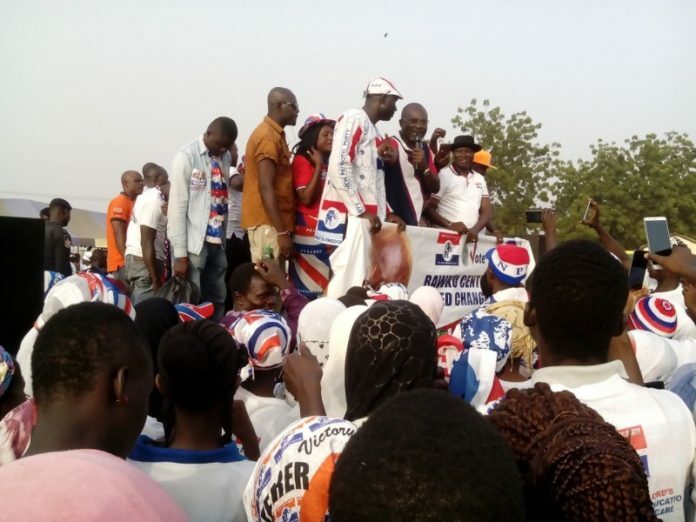 Mr. Agyapong’s speech, delivered at the Winamzua Park, also known as the Town Park within the NPP’s stronghold of Natinga, was largely an attack on notable figures in the governing party. “Ibrahim is the most corrupt boy you can ever find in this country. I’m warning Ibrahim, if he doesn’t [sic] shut up, I repeat, if he doesn’t [sic] shut up, I’m going to expose him. I have always allowed him to do whatever he is doing because I think he’s a businessman. And now that he’s campaigning as a politician, I will bring all his information out. Ibrahim is the one paying the soldiers all the money they are going to use to create confusion in this country. “And I want to assure him that, that day, if he makes a mistake, his soldiers cannot save him. Ibrahim is a small fly. What was he doing? His mother was a deep cocaine drug dealer. He was stealing cars. He always stole cars. That is how he started his life. Now, he wants to be a politician. So, we will start from the day he was born. Let us ask Ibrahim- what job was his mother doing? And they sit here saying Kennedy Agyapong is a drug dealer,” he rumbled amid applause and cheers from the audience. The rally also saw the controversial legislator disclose that the NDC government had awarded a guest house project to a Bawku-born contractor based in Accra, Ali Seidu, for a staggering contract sum in excess of $100 million. “Let me tell you, Ali Seidu is from Bawku. He has a lot of heavy-duty equipment at East Legon, just opposite East Legon Police Station. He has all the contracts in the Eastern Region- about 45 contracts. He’s building Bank of Ghana Guest House in Tamale. Bank of Ghana Guest House- it’s over 100 million dollars- in Tamale. Go and check. Ask yourself, if there is honesty in their administration, if they would be prudent to manage our resources, do you know how many guest houses they could have built with 100 million? “Check the figures of all the contracts that have been given to this gentleman. At least, if you are a road contractor and getting huge sums of money, Ali Seidu could have constructed this (Bolgatanga-Bawku) road. He could have done that. But all he does is he takes the money and gives Mahama’s share to him. Ministers go to his (Ali Seidu’s) office as early as 8:00am; they leave there at 3:00pm before you see him. Ministers upon ministers queue to see Ali Seidu because he gives them the money. And he is proud that Charlotte Osei goes to his office. Mahama has damaged you. Let us change this government. We are changing it for our children’s future, for the youth who are mature enough to marry but have no jobs,” Mr. Agyapong stressed as supporters clapped ceaselessly and used their fingers to make change gestures. 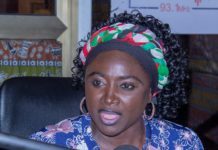 has publicly alleged the outspoken General Secretary of the ruling NDC Johnson Asiedu Nketia has refused to pay back an amount of $200 he loaned to him some time ago to defray some utility debts. Previous articlePresident John Mahama has hailed Ghana’s health insurance scheme, describing it as the best on the African continent. Next articleSupreme Court will today rule on the Electoral Commission’s suit challenging the High court ruling asking it to allow the PPP’s presidential candidate to correct the errors in his presidential nomination forms.